Adrián Cárdenas, post-doctoral researcher at the Instituto de Neurociencias in the laboratory of Neurogénesis and cortical expansion, led by Dr. Víctor Borrell, was awarded last March 13 the “Premio a Jóvenes Investigadores de Neurociencias” (Young Neuroscience Investigators Award) by the Institute of Neurosciences Federico Olóriz, in Granada. The award ceremony was framed within the activities of the World Brain Awareness Week 2019. 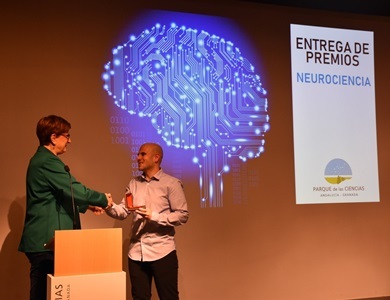 The brief ceremony was followed by a conference by Dr. Adrián Cárdenas titled: “Molecular control of cerebral expansión during evolution”, about his research work deserving the award.